This picture is courtesy of Richard Best, kayaker unknown. You need a good support stroke to prevent a capsize if you lose your balance or get hit by a wave. Just place a paddle blade flat on the surface of the water, out to the side of the kayak, and press down hard. Timing is important. When you press down on the paddle blade, obviously it starts sinking. It gives good support until it sinks more than about a foot below the surface. When it has sunk 2 feet or more it will give very little support. This takes less than a second so you have to make full use of the little time you have. The way to do this is with a hip snap. We find it helpful to make a distinction between recovery strokes used to get back upright when you are off balance, and brace strokes which stop you going off balance in the first place. It is easiest to learn recovery strokes in a swimming pool, in waist-deep water with a helper standing beside you. If you are going to do the stroke on your right, your helper stands on your left just behind your seat. The helper takes a firm grip of the rim of your cockpit, one hand behind you and one in front. That way, you won't hit them with the other paddle blade. At times you may capsize despite your helper's best efforts and (s)he can then do a Swimmer-To-Kayaker Rescue. Or the helper can be in a kayak alongside yours. Get the kayaks side by side, facing in the same direction. The other kayaker takes a firm hold of your kayak. You can then practice a recovery stroke on the other side. If you capsize, your helper can do a Kayaker-To-Kayaker Rescue. 1. Sit upright, holding your paddle in the basic paddling position. We're assuming, as always, that you have a feathered paddle with right-hand control. So, raise your right elbow and twist your right wrist until the right blade of your paddle is horizontal with its power face pointing upwards. 2. Reach out to the right with your paddle. Don't straighten your right elbow completely. For a first try, keep it bent at 90 degrees. For a low recovery support stroke, your right elbow is higher than the paddle shaft. Your paddle should be as horizontal as possible. Seen from above, it should be at a right-angle to the kayak. Put the back of the blade on the water. Lean your body a little towards it and suddenly press down hard (the "strike"). The strike is over so quickly that it is difficult to think of a hip snap but as you strike, leave your head and body where they are and use your hips to put the kayak back upright. A fraction of a second later, when the kayak is upright, you can sit upright. 3. To bring your paddle blade up to the surface again, go back to basic paddling position. With your right blade vertical, it easily slices up through the water. You have done your first support stroke. Try it again, with variations. Try leaning your kayak, body and head a little more to the right before you strike, and try varying the force with which you strike. You should not smash the paddle blade down onto the surface with noise and spray, but your strike must be quick and firm so that the blade does not just sink, with you following after it. The further you lean over, the further you can reach out with your paddle, so the more leverage you have to bring yourself back upright again. But you should keep your left elbow bent to at least 45 degrees less than straight. If you want to lean further over, change position slightly and do a high recovery support stroke. When you can do a low recovery stroke on the right, learn to do it on the left. Keep practicing, not only in the swimming pool but every time you go on the sea. Try doing a low recovery stroke when your kayak is moving forwards. See Low Brace. The most common fault is to lean your body or head away from the blade with which you are doing the stroke, as if you were afraid of getting your face splashed. This is natural, but with any recovery stroke or kayak roll it is important that the kayaker first gets the kayak safe and level, using the hip snap. Then the body and head can follow. When you strike, push your paddle blade vertically downwards. It should not slice towards the front of the kayak, or towards the back of the kayak, or hook back towards you. This is the same as a low recovery except that you lean over further, your elbow is lower than the paddle, and the power face of your paddle blade points downwards. This stroke requires a good hip snap. Note that in drawing 3 below, the kayak is very nearly upright again but the kayaker's head and body are still a long way out to the side. It is faster and easier if a helper stands alongside the learner's kayak. CAUTION: It is tempting to take the high recovery to extremes, throwing yourself from one side to the other and reaching out as far to the side as you can. Be aware that some people are vulnerable to dislocating their shoulders. It is a fairly common injury amongst extreme kayakers. Doing a powerful high recovery stroke with your outer arm straight at the elbow can cause a vulnerable shoulder to pop out of its socket. For a "how not to do it" picture, see The Safety Box. 1. Sit upright, holding your paddle in the basic paddling position. Raise your paddle by bending your elbows until the paddle is horizontal, about 9 inches in front of your chest, and twist your wrists backwards if necessary so that the power face of your right blade is facing downwards. Lean your body and boat over to the right, reach out to the right, and place your blade on the surface. Keep both hands low so that the blade on the water is as horizontal as you can get it. 2. Strike so that the blade goes vertically downwards. 3. At the same time, start your hip snap so that your kayak goes back to the horizontal a moment before you try to sit upright. Your body and head come up last of all. 4. To bring your paddle blade back up from deep underwater, rotate it so that the blade is vertical and then slice it upwards. With a little practice you should be able to get your right elbow in the water before you strike, then your right shoulder, then your right ear. An experienced kayaker can easily duck his/her head under water before coming back up again. Useful on a hot day. Practice on both sides, and not just in the swimming pool. If you carry on going over further and further, eventually you could go completely upside down before you strike and bring yourself back upright. It's a basic but effective kayak roll. The usual fault is to attempt to bring the head up first. Remember your hip snap - the further over you go, the more you will need to use it. Get your kayak horizontal first, then let your body follow it, then head. Remember to keep both hands low so that your paddle is nearly horizontal when you strike; and remember to strike vertically downwards. Your blade must not slice towards the front of the kayak, or towards the back of the kayak, or hook back towards you. Just vertically downwards. The other common fault is to let the blade which is supporting you get too close to the boat. 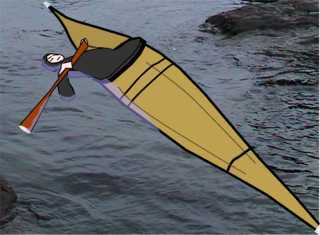 Seen from above, the paddle must be at a right-angle to the kayak so the blade is far out to the side. "The sea got worse and worse, till... it was terrific... Lots of times I went over beyond the point of balance, but always managed to scull myself up before my head went under". To keep your balance while stationary at sea, you will sometimes feel the need for something to rest on. You could raft up with another kayak, or scull for support using your paddle. This means sliding one paddle blade flat over the surface of the water, backwards and forwards along an imaginary line. The line is parallel to the side of the kayak but about 30 inches off to one side. Each time the paddle blade changes direction, change its angle so that its leading edge is always raised. This angle keeps the paddle blade on the surface, acting like a water ski. 1. Sit upright, holding your paddle in the basic paddling position. We're assuming that you have a feathered paddle with right-hand control. Twist your right wrist and raise your right elbow so that the right blade of your paddle is horizontal and the power face is pointing upwards. 2. Reach out to the right and put your back of your blade on the surface of the water, with the tip of the blade about 30 inches away from the side of the kayak . Keep your left hand low, just above the front deck of the kayak, so that the blade on the water is as horizontal as possible. 3. Look at the blade on the water. Raise the forward edge about 3 inches. 4. Skim it forwards over the surface, parallel to the kayak, until it is about level with your ankles. 5. Change the angle so that the rear edge of the blade is raised about 3 inches and skim it backwards, twisting your body to the left, until the blade is as far behind you as you can comfortably reach. 6. Now raise the forward edge and skim it forwards again. This time, try putting a little weight on the blade. Experiment with different blade angles and skim speeds, to see which gives the most effective results. Slower is better, and as you get more comfortable you will find you can scull quite slowly but still get powerful lift. As with the low and high recovery strokes, there is a low and high paddle position when you are sculling for support. The low paddle position is shown above. To lean over much further than this, you have to change position so that your elbow is below your paddle shaft. When you do a sculling brace in that position, the power face of your paddle blade is downwards and does the work. With practice you can scull for support with one shoulder in the water. That is difficult, exhausting and produces clouds of spray because you are supporting most of the weight of your upper body on your paddle. If you go right over until half your upper body and head are in the water, it suddenly gets much easier because the water supports your body. 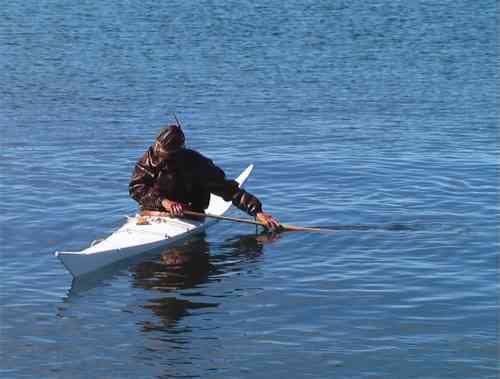 This is sometimes called Greenland sculling. You will need your hip snap to get back upright again. It works with any kayak but especially a very low-volume Greenland kayak with a cockpit so wide it goes right from one side of the deck to the other. If you are wearing a tuiliq, you can rest with your head and outspread arms on the surface and may not need to use your paddle at all. This is nalaasaarneq. ...sa(a).... means use to, or something you usually do or can do. So, nalaasaarfik is a sofa = place where you use to sit back (...fik = place)". A good way to practice support strokes is to invite a swimming friend to try to climb onto the back of your kayak while you use vigorous support strokes to stay upright. See Kayaker-To-Swimmer Rescues. If you have an unstable kayak there may be times when you are stationary, want to do a task which can be done one-handed, want a little help to stay upright but don't want to raft up with a friend. You can do a sculling brace with one hand by pinning the other end of the paddle shaft between your ear and the shoulder of the sculling arm. A brace is a useful precaution if you think you may lose your balance. 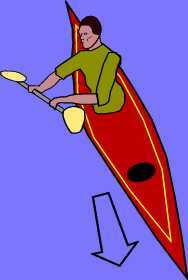 If your kayak is moving you can use your paddle blade for balance by letting it skim over the surface, rather like a water ski. Reach out to the left with your paddle. Place the back of the blade on the surface as if you were going to do a "low recovery" support stroke. Your paddle is now ready to support you if you need it. As always, reach out as far as you comfortably can but not too far. Both elbows should be slightly bent. Keep your right hand low, just above the foredeck of the kayak. Put the supporting blade on the surface so that it is almost flat. If your kayak is moving along, keep the front edge of the blade slightly higher than the back edge so that it acts like a water ski. The low brace is a very useful stroke if a breaking wave hits you from the side. Reach out and put your paddle blade horizontal on top of the wave. The rotational forces within the wave will prevent the paddle blade sinking, and you can lean on it if you need to. So that your kayak doesn't trip when the wave shoves you sideways, you must edge your kayak towards the wave and if necessary lean into the wave. See Paddle Strokes For Surfing. If you are using a low brace only to give you confidence, for example when going from a back eddy into fast water, just let the blade skim lightly over the surface. If you press it down onto the surface it will give you support. The faster you are going, the more support it will give you. As your confidence builds, you can put the whole weight of your upper body onto the paddle for a few seconds. See Breaking In, Breaking Out. When you're doing a left-sided low brace in a moving kayak, if you press the blade down on the surface it will slow you down and make the kayak turn left. Just before you come to a halt, push the blade firmly forwards. This is a low brace turn, useful when coming alongside a dock or another kayak. 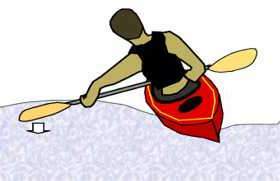 The kayaker in the image above is moving forward at a good speed, has just use a forward sweep stroke on the right to initiate a turn to the left, and is now edging the kayak so it leans over to the left and putting some weight on the paddle. The drag of the paddle makes the kayak turn left; and the water ski effect means that the kayaker can confidently press down on it and lean into the turn. A low brace is good for small waves, a larger wave calls for a high brace. It is exactly the same except that your elbows are below your paddle shaft and the concave side of the blade faces down. It's the same position as for a "high recovery" support stroke. You will find it useful if your kayak turns sideways while you are surfing down a breaking wave. Lean hard into the wave, raise the downwave edge of your kayak and hang on. See Sidesurfing. Sometimes called the running low brace, this works only if your kayak is moving forwards at a good speed. If you move your low brace back a short distance towards the stern by rotating your upper body in the direction of your supporting blade, you have a support stroke combined with a steering stroke. This is very useful if you are surfing down a wave because the water ski effect will give you so much support that if you lean right over and put the supporting blade at least 20 inches out to the side, you can put most of the weight of your upper body onto it. Apart from being fun as you lean out over racing water, this also gives you powerful steering because the supporting blade acts as a brake.